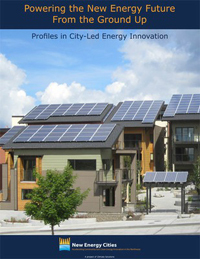 Powering the New Energy Future from the Ground Up profiles the early results of a diverse range of small- to medium-sized American cities with different economic and energy profiles that are pioneering the clean energy economy. Many communities used federal grants to jumpstart long-term strategies to test and refine various clean energy and energy efficiency solutions. Others developed innovative financing strategies in the absence of grant money. These city-led efforts to catalyze local clean energy economic development are important to watch as federal grants sunset, especially in the absence of a comprehensive national energy or climate policy.